An herbaceous wine with typical cultivar characters. A medium-bodied wine with prominent tropical flavours and floral undertones. Will develop well with age. A good partner for fish dishes (might even stand up to game fish), pastas and salads. Grapes come from the high altitude Piekenierskloof. A barrel-fermented wine with an average of 9 months in the wood; 30% new barrels. A medium-bodied, fruit-driven wine with prominent citrus characters. Subtle wood components add to the complexity. A wine that needs some ageing. Enjoy this wine with chicken dishes, pastas and light curries. 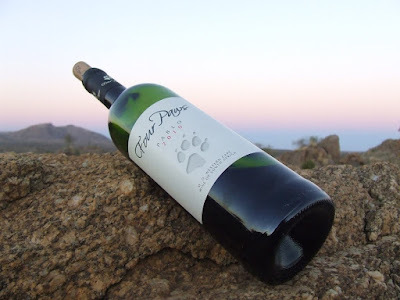 An un-wooded white blend, easy drinking, well rounded, but with lots of character and depth. A fine-balanced wine with prominent fruit flavours. A wine for all occasions. Enjoy with fresh salads, anti-pastas, pastas and with a sunset. Grapes come from the high altitude Piekenierskloof from dry-land bush vines, older than 40 years. A full-bodied, well-structured wine with lots of character, deep colour and packed with wild-berry flavours. 12 to 14 months in barrels, not more than 40% new wood. A good companion for red meat and game dishes. A red blend of the selected best in the cellar. A blend that varies according to the cultivars that perform best in the specific season. A well-structured, delicate wine with a fine balance and lots of dimensions. 12 to 14 months aged with selective wood use. A wine that will go well with light pasta dishes to heavy stews. The Four Paws team are passionate about our wine, but we are also passionate about animals, particularly cats. We aim to infuse our wines with elegance and balance, the same characteristics shown by a cat as it ambles confidently along a garden wall. Cats exhibit fine senses, and this is what we want people to experience when they see, smell & taste our wines. Phone us, come meet us, come visit... we miss you, yes you. For orders in Europe - click here. For orders in the UK - click here. Copyright © Four Paws Wines™ is a registered trademark. Website Design by Zanli de Jager. Template by Templateism. Hosted on Blogger Platform.